Track Santa’s Journey Using NORAD’s Advanced Technologies. This Christmas you will once again be able to Track Santa Claus’ Journey on the internet using NORAD’s advanced technologies. Grown-ups and children alike can go onto NORAD’s website and watch Santa Claus as he travels around the world using all the latest science and technology. As we all know Christmas Eve is very serious business and nobody takes it more seriously than NORAD (North American Aerospace Defense Command). As we all know, in these times, everything Air-Bourne must be closely monitored and tracked in order to keep the skies safe. All vehicles whether Passenger plane, Military aircraft or space vehicle are all tracked and this includes Santa’s sleigh! NORAD does the good job of monitoring Santa’s Air-space to help him on his way but also provides Air-support to Santa Claus. In brief, the North American Aerospace Defense Command (NORAD) is a United States and Canada bi-national organization charged with the missions of aerospace warning and aerospace control for North America. For more than 50 years, NORAD and its predecessor, the Continental Air Defense Command (CONAD) have tracked Santa’s flight. The tradition began in 1955 after a Colorado Springs-based Sears Roebuck & Co. advertisement misprinted the telephone number for children to call Santa. 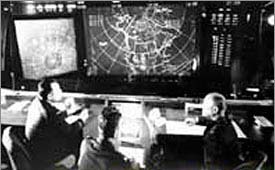 Instead of reaching Santa, the phone number put kids through to the CONAD Commander-in-Chief’s operations “hotline.” The Director of Operations at the time, Colonel Harry Shoup, had his staff check the radar for indications of Santa making his way south from the North Pole. Children who called were given updates on his location, and a tradition was born. Since that time, NORAD men, women, family and friends have selflessly volunteered their time to personally respond to phone calls and emails from children all around the world. In addition, we now track Santa using the internet. Millions of people who want to know Santa’s whereabouts now visit the NORAD Tracks Santa website. The moment that radar indicates Santa has lifted off, NORAD use their second detection system. Satellites positioned in geo-synchronous orbit at 22,300 miles from the Earth’s surface are equipped with infrared sensors, which enable them to detect heat. Amazingly, Rudolph’s bright red nose gives off an infrared signature, which allows their satellites to detect Rudolph and Santa. The third tracking system is the Santa Cam network. NORAD began using it in 1998, which is the year they put theirr Santa Tracking program on the internet. Santa Cams are ultra-cool, high-tech, high-speed digital cameras that are pre-positioned at many locations around the world. NORAD only uses these cameras once a year. The cameras capture images and videos of Santa and his reindeer as they make their journey around the world. The fourth system is made up of fighter jets. Canadian NORAD fighter pilots flying the CF-18 fighter jets intercept and welcome Santa to North America. In the United States, American NORAD fighter pilots in either the F-15, F-16 or the F-22 get the thrill of flying alongside Santa and his famous reindeer: Dasher, Dancer, Prancer, Vixen, Comet, Cupid, Donner, Blitzen and, of course, Rudolph. Finally, media from all over the world rely on NORAD as a trusted source to provide updates on Santa’s journey. The Science of Christmas: Santa, Reindeer, Sleigh & Chimney Explained. Christmas and science may not appear to have much in common but a good knowledge of science is what has allowed Santa Claus to keep the Christmas spirit alive for so many years. Science is what allows Reindeer to fly and for all those presents to be delivered in one single Christmas Eve. Most people think that Santa Claus only works one day a year but everyone in-the-know in the Science and Technology industries is aware that Old Saint Nick spends quite a lot of the year in his research lab making sure that every year things work better and better. When you think of what a big operation Christmas night is you realise how much preparation he has do: Everything from preparing the sleigh for the enormous flight stresses that it will be under from the incredible speeds & acceleration, to ensuring his workshop uses the latest technology and quality control standards, right down to job recruiting new Elves and helpers to deal with increased global demands. All this has to be taken into account and this is where science plays a big part. The Tech Behind The Sleigh? If we assume that Santa has to travel 510,000,000km on Christmas Eve, and that he has 32 hours to do it (Travelling east to west with the Sun, maximising his available night-time, Santa has about 32 hours to work with assuming children sleep for eight hours, he has 24 hours plus those eight to finish), then Santa will be travelling at 10,703,437.5km per hour (1,800 miles per second) which is incredible. The fastest-moving human-made object in history is the space probe Voyager 1 which manages a rather less impressive 10.8 miles per second. As well as having to cope with the immense pressures exerted on the sleigh due to the speed, there are also the intense gravitational forces created by the weight of the Christmas presents. To counter these forces and to stop the sleigh plummeting to the ground the sleigh uses many different technologies, super-light-matter carbons and special anti-gravity composites. These also help to shield Rudolf and the Reindeers from the extreme g-forces they will encounter as they accelerate to 1800mph and decelerate again suddenly, as they move from house to house to make sure all the good boys and girls get their Christmas toys and gifts. Rudolf and the other reindeer play a very important part in the science of Christmas and Santa has spared no expenses in research when it comes to ensuring the Reindeer’s safety and health. The Reindeer are a vital part of the Christmas Night team and do very important jobs in guiding the Sleigh. While the sleigh may contain more advanced technology than the space shuttle and better guidance systems than Air Force One, Father Christmas never just relies on technology alone. It is well know that Santa Claus is a big lover of animals but also has a great respect for what the sciences can learn from studying the animal kingdom. The Reindeer have a superior sense of direction to any technology and this is why Santa Claus relies on Rudolf to safely guide the Reindeer & Sleigh through the Quantum eddies and temporal currents. However, science can lend a helping hand. We all know about Rudolf’s Red nose and the sound of the Reindeer’s bells that can be heard on Christmas night if you listen carefully, but there is also a very valid scientific explanation for this as well. 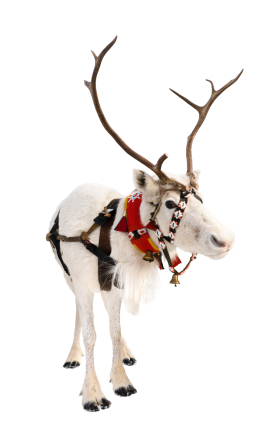 It is a closely guarded North Pole secret as to how the tech works but what is known is that Rudolf’s shinny nose houses a tiny “temporal-tag” and combined with the metal in the special bells you see on the Reindeer’s harness; serve as a Deflector shield and sensor array. The deflector shield and sensors helps Santa, the Reindeers and the sleigh safely navigate from house to house. The jingle, jingle ringing you hear from the bells is in fact the deflector shield pulsing and sending out a field in front of the sleigh similar to the way a Dolphin uses it’s sonar. Last but by no means least, the mystery of the Christmas Chimney. Have you ever wondered how Santa Claus is able to make it down the Chimney into your living room, even in a house that has had the flue blocked up? Well, you have science to thank for that too and some of the details as to how Santa Claus does this have recently been declassified by the North Pole. Apparently, Father Christmas stands on the roof and sprinkles a super advanced “Nano-tech dust” down the chimney – this creates a transponder field that allows Santa Claus to teleport from point A to B, from the roof into your living room. So what if the Chimney is blocked I hear you scream? Well, all houses have air vents hidden in the wall and they lead up to the roof and work in a similar way, allowing the dust to float into your sitting room. All though the North Pole have refused to comment there have been rumours on Wiki-Leaks that it was Santa Claus’ Chimney trick that inspired the famous “Transporter” in the popular Star Trek TV series. This is just a sample of some of the science that goes into making the Festive Season go off without a hitch. So next time someone says that Science and Christmas don’t go together, you will be able to explain to them about all the things that Santa Claus, the Reindeers and all the Elf working in the North Pole laboratories and toy shops do to make it a very, Merry Christmas for everyone.